First things first- I am SO not the girl that has thought about her wedding day since infancy. It just isn't me! Or so I thought... Then this thing called Pinterest was created and my little heart started fluttering every time I saw a pretty wedding gown or flower arrangement. At first I fought the urge to create a "Wedding" pin board. Then, I gave in and 139 pins and 584 followers later, here we are. I have found quite a few creative ideas for wedding ceremonies, and wanted to share them with my readers. 3.) 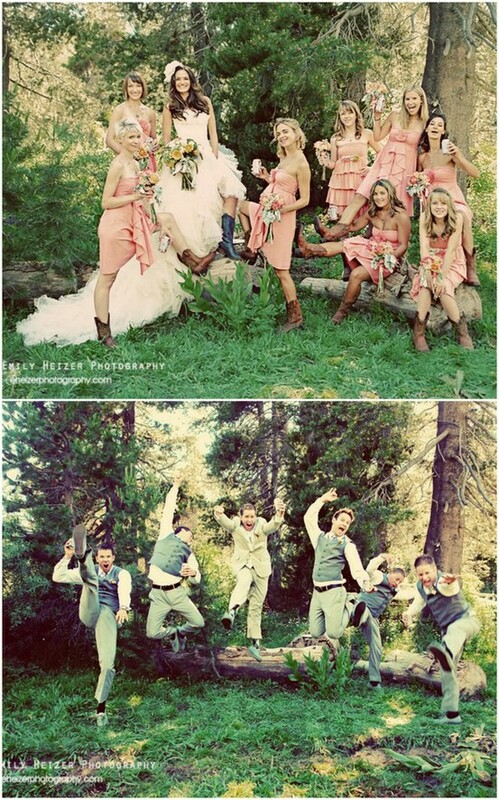 Do a role reversal photo- bridesmaids act like groomsmen, groomsmen act like bridesmaids! I am still not sure how I feel about the idea of a bridal boudoir photoshoot, but if I were to do one I'd definitely want to keep it tasteful. I love the idea of using a long veil as the bride does here- oh so classy! 7.) 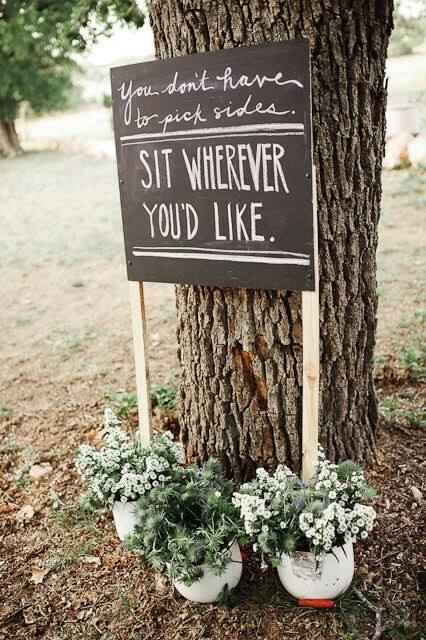 Have guests sit wherever they choose at the ceremony. Such a cute way to integrate 2 new families! 11.) 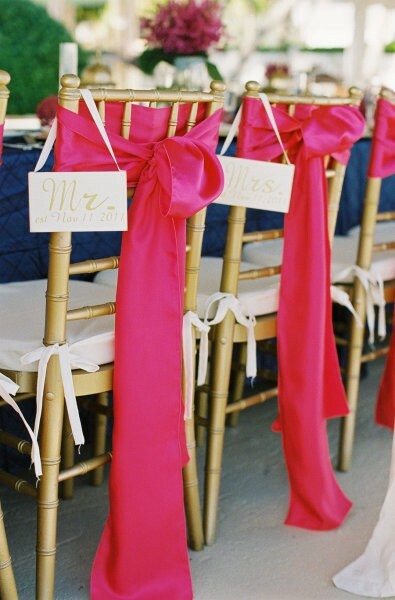 Hang a "Mr." and "Mrs." sign on the back of the groom and bride's chair at the reception or rehearsal dinner. Aren't these ideas so fabulous? Have you found any fun ideas for your wedding on Pinterest? I salute the brides that planned beautiful weddings before the inception of this site! You all are truly the creative ones! To see my entire Wedding pin board, click here. Love, Love , Love all of these ideas! #3 & #5 are halarious! Following you on pinterest now! oh my goooooosh...I'm LUSTING OVER EVERYTHING!!! amazing!!! Love those milk glasses with the cookies on top ;) so sweet! THese are seriousily some of the best ideas, ever. Sending this post over to Natalie! She's gonna love it! I'm obsessed with that short wedding dress - LOVE it. slash I really want it for my rehearsal dinner! Oh my goodness I love this. And as someone who is getting married at the end of the year I think I'm going to need to save this post for ideas later!! Oh wow! 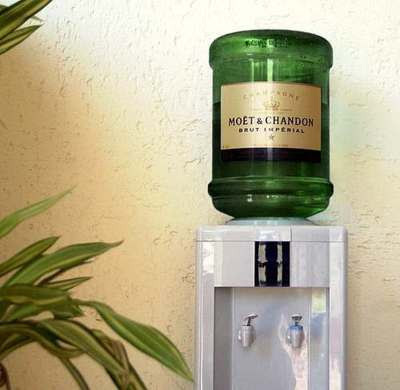 Love the champagne water cooler. Great photos!! If only they had pinterest when I got married! Such amazing ideas!! These are all such great ideas. 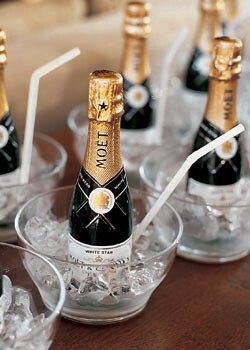 Love the mini champagne bottles on ice. The boudoir photo is a great idea you can possibly gift to the husband on an anniversary. yeah, it's hard not to plan on wedding with all these inspiring images floating around, haha! i like the role reversal photos - too funny! Your pins are all incredible! Being an August 2011 bride... I am quite upset that Pinterest didn't exist even those five short months ago ;) The faux wedding gown is absolutely stunning!! I got married even before digital photography! There are so many things I would do over! 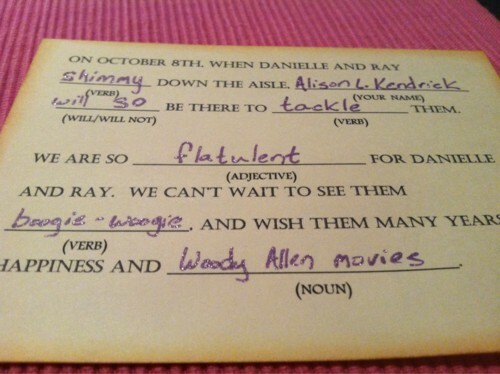 Love that RSVP mad lib card. Brilliant! 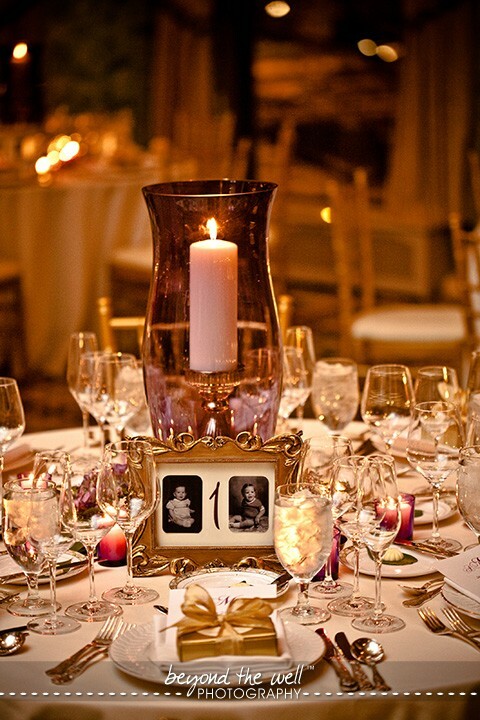 There is nothing more fun than wedding planning and these ideas are fabulous. Love the cookies and milk for the children or for a late night snack for the guests!! loving #8, 9, 10! cute ideas. So many adorable ideas...and Pinterest is a treasure trove of ideas! Love the photos of the groom/bride at each table, at the age they were then. 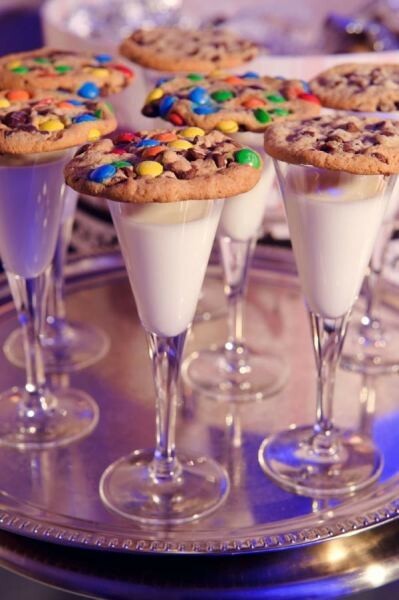 Also, how cute to have milk in champagne glasses and cookies for little ones to toast the couple. This makes me want to plan a 2nd wedding!!! #5 is amaze balls in any situation #6 is such a good idea. I didn't do it bc I didn't like the way my body looked at that age (27 and no kids-I was crazy not to walk around naked). #10 is such a cute idea!!! Oh my word. Thank you for sharing this! I absolutely love the idea of role reversal for pictures - those pictures are hilarious! I also never dreamed about my wedding when I was younger. It wasn't until a year or two ago probably that I started thinking about it and then Pinterest came along and bam! I'm now obsessed. So many great ideas here! Looking at wedding photos is so addicting. Love your inspiration! Wedding pictures really give huge amount of inspiration for couples who are planning to get married. If they have planned to get married long island country club they are pretty lucky because that a great place to get married. I wore my mom's veil. It was lace trimmed and my dress was plain so it worked perfectly! You idea about is awesome !! you are really a Genius. cuts on Tehran's present nuclear activities, it is also important for the IAEA as it tries to kick-start nearly a decade of stalled attempts to probe allegations that Iran worked on nuclear arms. Washington says that Iran must cooperate with the IAEA's probe as part of any overall deal before all sanctions on it are lifted.